My home office is located about 5 miles south of Traverse City, in a quiet neighborhood off of West Silver Lake Road. It's a comfortable, beautiful, and sacred space for doing deep healing work. One of my clients calls it "the healing vortex" room! "Building Emotional Balance" to learn four simple but powerful tools you can use at home to shift difficult feelings. To get the guide, click here. Sign up for a free initial phone consultation. 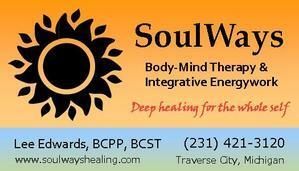 Call 231-421-3120 or click here to schedule a time to discuss your situation and how SoulWays Body-Mind Therapy can help. I have a thriving Facebook community where I share inspiration and self-care tips, and I’d love to have you as part of it! Like my page by clicking here.